Summary Judgement: The movie has a great concept for about fifteen minutes, then the story nose dives into monotony, cliché, and thoughtlessness. Cargo has all the elements of a great piece of science fiction: a rust bucket deep range cargo ship, an Earth rendered uninhabitable by pollution, large corporations masquerading as government, space terrorists, and a Human Diaspora to cramped space stations which serve as holding pens for the huddled masses, likely in perpetuity, while a privileged few live on the paradise world of Rhea. European, dystopian, space based science fiction, that’s a no brainer of awesome, right? Well that’s what I thought when the movie started. An absolutely stunning opening scene sees the camera panning around, across and through a massive rotating space station that seems to borrow the best parts of Babylon 5 and Blade Runner. Minutes into the movie and the world already feels lived in to the point of total breakdown. The inside of the space station is dark and dank as water drips from overhead pipes. Think about the lower decks of Alien’s Nostromo and you have a good approximation of the better parts of Cargo’s space station. 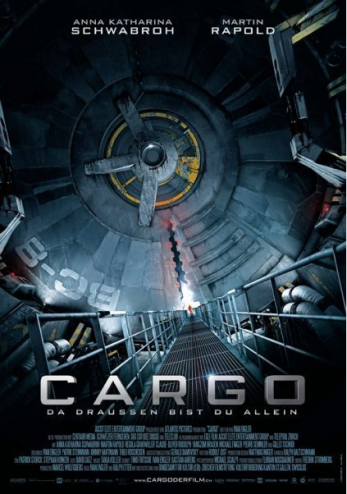 Aside from the fact that the protagonist, Dr. Laura Portman (Anna-Katharina Schwabroh) introduces the backstory and plot through a bit of twenty-third century blogging, Cargo had me hooked. The aforementioned blogging offers the following information. Laura’s sister Arianne is living on Rhea. The good doctor longs to join her sister in paradise as she has had enough of the disease and epidemics that accompany life on the space stations. To raise the funds that she needs to relocate to Rhea, Laura braves the dangers of space terrorism and long term isolation as a medic aboard the interstellar cargo ship Kassandra. Unfortunately, the name’s the thing in Cargo. On some level, I’d like to think that naming the starship Kassandra was a happy coincidence; if the evil corporation that runs the world of Cargo is going to make Rhea look like the Elysian Fields in its commercials, why not name a ship after the second daughter of King Priam of Troy as a way of maintaining the mythological motif? It’s a tragically ironic choice as the movie descends from an opening sequence that comes close to making the act of watching a movie a tactile experience, to a contrivance of clichés that is so predictable that I too felt cursed with Kassandra’s gift of prophecy and foresight. Viewers beware that so long as you possess half a brain and haven’t been living on a space station these last ten years you too will feel like the Oracle at Delphi when you guess the movie’s ending before its first hour is complete. I’d expound further on the predictable nature of the movie were it not for the fact that the most natural comparison therein would constitute a giant spoiler. Instead, I’ll simply say that when the revelation comes, it comes with all the gusto and originality of a post-Sixth Sense M. Night Shyamalan movie. At least he had the decency of putting the “what a twist” moment at the end of the movie. Cargo will make you sit through a pointless extra hour of story while the characters struggle catch up with the audience. Part of the problem with Cargo is that it feels like a movie that was written by committee. This should come as no surprise considering that five people share writing credits. Bucher and Engler have a joint “story by” credit while Steinmann, Roscheisen, and Hartman share the “screenplay by” credit. Movie making might be a collaborative project, but it’s obvious in this story where one person’s influence begins and another person’s ends. In the end, Cargo fails one very important litmus test for me, the CPR test. If in a fictional work a doctor performs CPR on a person who has no pulse, rather than getting a defibrillator, then pulls the “He’s dead, Jim” shtick, the movie fails the CPR test. Anybody who’s ever taken a first aid course knows that CPR doesn’t start hearts, unless you are on Baywatch. Once a movie fails this test, I start noticing all the other small flaws. Why is a starship burning its main engines when cruising through the void? Why aren’t people aspirating cryo goo while wearing those not very airtight looking face masks. Why does the space station rotate to make gravity but the spaceship doesn’t? How in god’s name did that person randomly fire space suit thrusters and still manage to hit the tiny airlock on a moving starship without so much as a slide ruler to help with the math? Are we using night vision in this scene because we are too cheap to properly light a very dark set? Those flaws very quickly add up to a place where I’m doing my best impression of a cranky old man longing for the good ol’ days of space movies. Twas a good effort, Cargo. In another world, a world where you were written by one person and the mood was consistant from start to finish, I might have liked you. You could have been the sci-fi import that I bragged about to all my friends. Instead, you’re at best on par with a SyFy original feature.